Hero Academy is the game I've been longing for. I didn't know how much I needed a game like this, but now I'm playing it more than anything else. I've been in the mood for a nice tactical game without twitch elements, and Hero Academy fills that role perfectly. The premise of Hero Academy is simple. On your turn you get five actions to spend how you will. 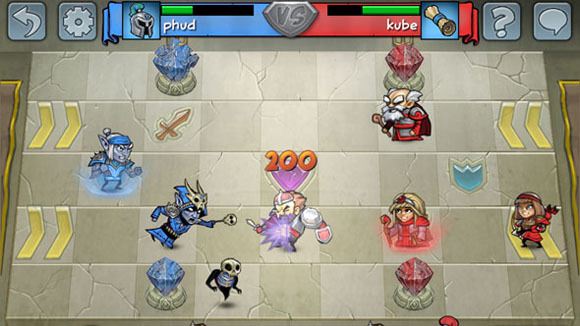 The game plays out asynchronously over multiple turns. If you destroy your opponent's crystals or kill all of their units you emerge the victor. These five actions can be to move a unit, attack with a unit, or bring an object into play from your current available "hand" at the bottom of the screen. The objects you'll bring into play are more units, equipment for existing units, and spells that you cast on the battlefield. At the end of every turn your current hand of objects refills up to six. Those are the basic mechanics of the game, but it's far more interesting than it's moving parts. It's a deep game of strategy and tactics that requires a careful balance of deploying, equipping, attacking, and defending. It's a game full of interesting choices. Is it better to go straight for a crystal kill or to slowly dwindle enemy forces over time? Should I spend a turn re-positioning five different units or spend all five actions attacking with a single unit? Is it more important to get many units on the battlefield or should I deploy one unit and deck him out in as much equipment as possible? The answer is... it all depends on the situation. With asynchronous turn based combat there is plenty of time to think your options through. This game will appeal to you cerebral players out there. I find it really fun to watch my games play out over the course of multiple hours or, more often, days. Fortunately, Hero Academy doesn't limit you to only playing one game at a time. I regularly have 30-40 games going at any given time that I check on a few times throughout my day. I'll take ten minutes, play through one turn in each game, and then put it out of my mind for a few hours while I wait to see how my opponents respond. 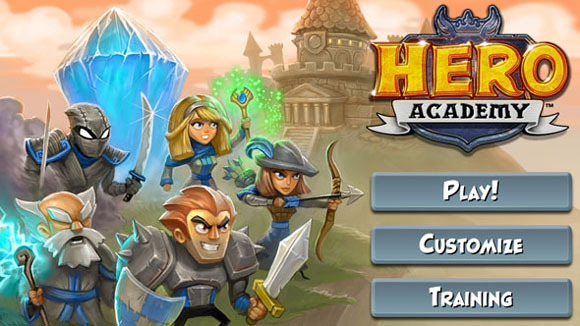 There are currently four different teams in Hero Academy. They function like different factions or races do in most RTS games. The Council is the standard human-ish race and is totally free to play. They have a nice all around balance and lots of healing power. Since they are completely free there is no excuse to not try this game. I'm so in love with Hero Academy that I ended up buying access to the other three teams for about $2 each. The Dark Elves are all about lifesteal, regeneration, and increasing power over time. Dwarves have lots of area of effect attacks and are great at getting crystal kills. The Tribe is modeled after Orcs and specializes in aggressive combat tactics. Every team is good in their own way, which helps keep the game fresh and exciting. Robot Entertainment, the developer, plans on adding even more teams as time goes on. Hero Academy has gotten more play time from me than anything else since I bought my iphone. I've played it more than all my PC gaming and console gaming put together in the last month. I can't recommend it enough, especially if you're someone who likes tactics and turn based combat. It's currently available on iOS and will soon be out for Android too! Feel free to send me a challenge in game, my Hero Academy name is Void19. Android, hm? Might be able to play this on my wife's phone... so yeah, I'll check it out. Thanks for the writeup!